Unionized workers of cash-strapped shipbuilder STX have agreed to a restructuring plan. 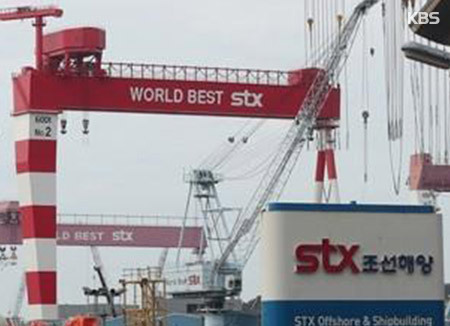 The labor union of STX Offshore & Shipbuilding completed negotiations with management at around 6 p.m. on Tuesday and then submitted a letter expressing its commitment to the plan to the company’s main creditor and largest shareholder, Korea Development Bank(KDB). KDB initially set Monday as the deadline for the labor union’s agreement, threatening to place the company under court receivership if the deadline was not met. The state-run bank, however, is known to have changed its stance and plans to review the workout plan and decide on whether or not to call for court protection for the shipbuilder through consultations with the government. The details of the restructuring plan have not been disclosed. The labor and the management are known to have reached an agreement that workers will take six months unpaid leave every year on the condition they are not required to make additional sacrifices on top of already discussed pay cuts.